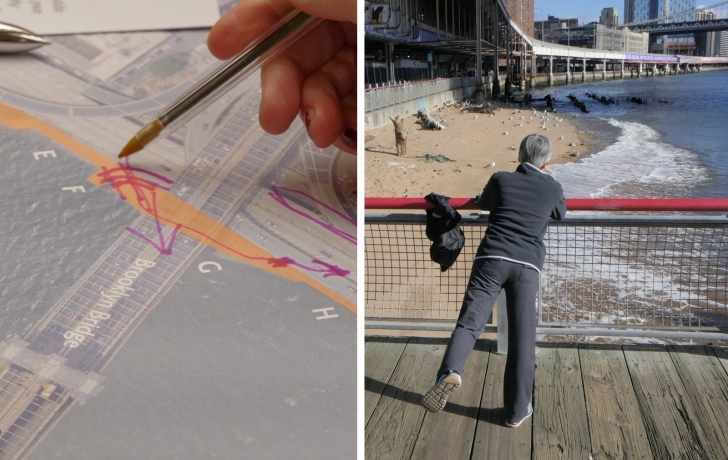 Last week, the city kicked off its public design process for the Brooklyn Bridge Esplanade, the quarter-mile stretch of East River waterfront from Peck Slip to Catherine Slip. But it was a small sandy patch, just 191 feet long and lapped by the river’s waves, that grabbed much of the attention. For more than a decade, advocates have called for the city to turn the officially off-limits sliver of sand, popularly known as Brooklyn Bridge Beach, into an accessible, fun-in-the-sun destination. And that was the message again at the Jan. 8 public outreach meeting, where the city’s Economic Development Corp., the agency that manages the property, solicited ideas for the soon-to-take-shape esplanade plan. Improvements to seating, lighting, bike and pedestrian paths and landscaping are part of the $21 million project. So, too, is “shoreline access.” But what that means exactly is yet to be determined. “All the other frickin’ boroughs in the city have a beach, and we need a beach,” announced Manhattan Borough President Gale Brewer, whose office hosted this first “community outreach phase” of the design. Seated at tables, with maps, markers and Post-Its at hand, participants were asked to give their priorities for the Brooklyn Bridge Esplanade, one segment of the two-mile-long East River Waterfront Esplanade that runs from the Battery Maritime Building to Montgomery Street. Outdoor fitness equipment, fishing access, resilient vegetation, and a floating pool were among some of the suggestions. But it was the desire for a beach—whether for swimmers, boaters, or people who just want to sit close to the water—that dominated the meeting. Within about a month, Wittwer-Laird said, her firm would come to Community Boards 1 and 3 with early design concepts, and by the end of next summer the final design will be complete. The finished project, following 15 months of construction is expected at the spring of 2021. The project, she noted, needs to be coordinated with other work in the area, such as the reconstruction of Peck Slip and an East River coastal resiliency project.